Intended to help introduce allergy treatment in everyday practice and to prepare physicians and office personnel for the pursuit of such a practice. The authors cover basic immunology, testing methods for inhalant allergy, environmental control, allergic emergencies, pediatric allergy, and allergic fungal sinusitis. Appends information about cross-reactivity between plants, a pollen guide, and hidden sources of common allergenic foods. Annotation c. by Book News, Inc., Portland, Or. The foremost guide to diagnosing, testing, and treating all major ENT allergies is back in an updated second edition. Combining practical management strategies with the latest advances, here is the complete how-to resource for health professionals who treat ear, nose, and throat allergies. 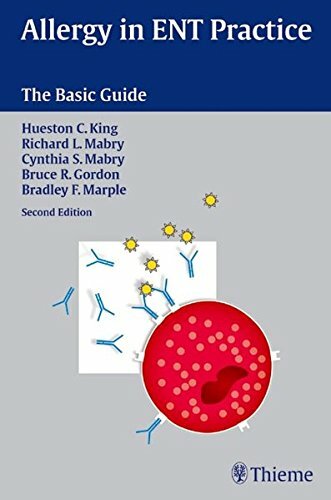 It covers everything from testing methods and pharmacotherapy to food allergies, allergic and non-allergic rhinitis, pediatric allergies, and sinusitis--key information for every practice.Special features include: -An explanation of basic procedures such as assessing patient history, skin and in vitro testing, identifying symptoms, starting immunotherapy, and heading off emergencies -Every chapter revised and updated, with key advances in areas such as immunology, pharmacotherapy, and the role of fungi in chronic rhinosinusitis -Brief capsules of pertinent information for nurses and ancillary personnel--written by a highly experienced otolaryngic nurse-Recommendations for adding allergy care to an existing ENT practice, finding qualified staff, and interacting with patients-Useful appendices covering plant cross-reactivity, pollen distribution, and allergenic foodsEasy to implement for both the practitioner and ancillary caregiver, this book belongs within easy reach of all physicians who want to expand their practice into this rapidly growing field. King, Hueston C.; Mabry, Richard L.; Mabry, Cynthia S.